If you suffer from irritable bowel syndrome chances are you spend many days being uncomfortable and missing work because of your condition. Although there is a large body of irritable bowel syndrome clinical research, not much is known about the disease. While some suspect it is the result of a yet to be discovered infection others believe there is a mind/body connection. There is no known cause, no clear diagnosis method and no cure. There are ongoing irritable bowel syndrome clinical trials being conducted. 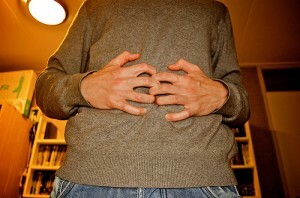 Irritable bowel syndrome (IBS) is also sometimes called spastic colon. Irritable bowel syndrome is diagnosed when no specific cause can be found for a condition that involves chronic pain in the abdomen, bloating and abnormal bowel habits. There are several classifications of IBS – constipation predominant (IBS-C), diarrhea predominant (IBS-D) and alternating between the two (IBS-A). The cause of irritable bowel syndrome is not known. Some believe it is a disorder where the brain and the gastrointestinal tract have trouble communicating. Others believe it is a psychological disease resulting from stress. Irritable bowel syndrome was first documented as such around 1950. Many tests have been done on diet and how this might affect a person suffering from IBS. In some patients restricting their diet of lactose or fructose has helped in treating irritable bowel syndrome. Taking in more soluble fiber has also proven effective. Depending on the type of IBS different medications like laxatives or antispasmodics can be prescribed. Psychotherapy including cognitive behavior therapy and hypnosis has been effective in treating irritable bowel syndrome. As a last resort for the treatment of irritable bowel syndrome tricyclic antidepressants are sometimes prescribed.